One of the defining characteristics of the current state of hospital design and construction is that most of it is done on existing facilities. The majority of hospital design projects involve upgrading existing hospital departments, often times while the department itself or those immediately adjacent remain fully operational. The challenges this reality presents are many; dealing with the noise, dust and disruption has become the standard operating procedures of those who work in hospital design and construction. 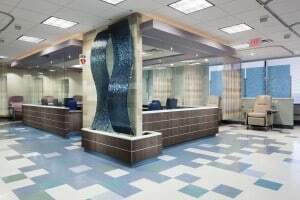 To achieve a well-executed design at the Mellon Pavilion Infusion Center site it was worth the effort for the West Penn Allegheny Oncology Network (WPAON). This project was part of a system wide initiative of the WPAON to improve its cancer treatment facilities. Initially, IKM surveyed all of the thirteen WPAON sites and recommended changes for improving the patient experience, streamlining throughput and supporting the facilities’ positive impact to the revenue stream. The Mellon Pavilion site was the sixth of the WPAON facilities to be renovated as part of the initiative. 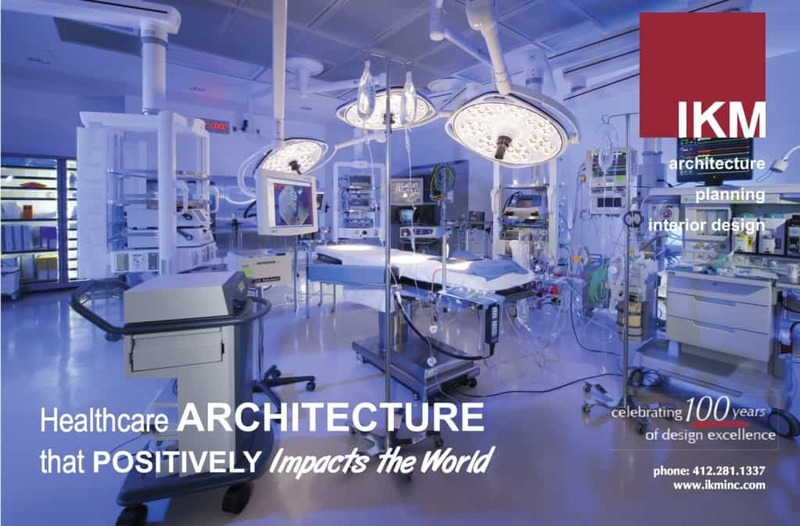 The renovation program was a component of re-thinking the WPAON approach and the design reflected the sense of constant improvement that WPAON brings to patient care. For the WPAON infusion center the design was influenced by a broad base of evidence about how cancer patients respond best to treatment and how the caregivers operate best. The considerations went well beyond purely clinical, taking even cultural observations into account. At the West Penn infusion center this translated into focusing the design, and the budget, on the common areas and especially on the infusion stations. The IKM design took into account the need for space for the family or friends, since chemotherapy patients generally are accompanied by someone close. For these caregivers, respite areas were designed along the perimeter to give them windows and light. While this is a nod to the caregivers, the desired result is also better patient care from a staff that has more engaged caregivers involved in the process. Special emphasis was put on the design of the infusion area, patient lobbies and respite areas. The infusion stations receive plenty of light, with the windows separated from the patients by individual blue poly-resin panels. The panels were also used as dividers between infusion stations in a vertical curved wave that give the impression of water and offer a beautiful, soothing visual effect. 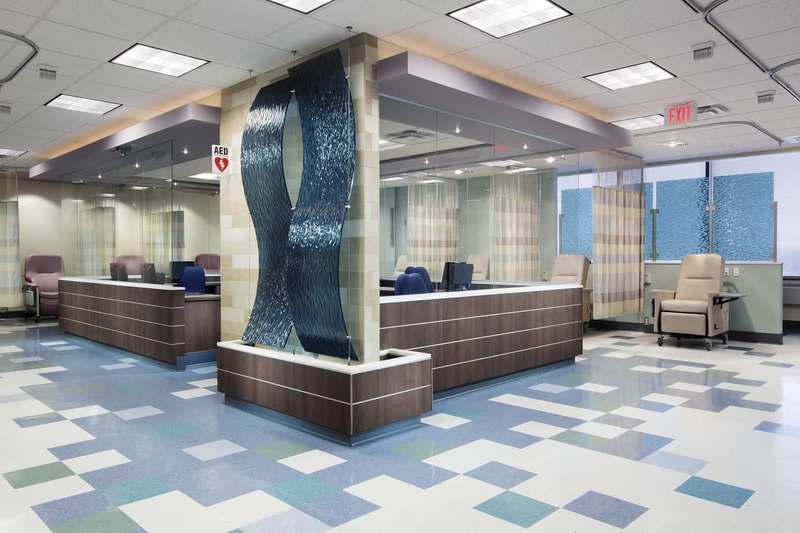 The casework and lighting fixtures were upgrades in the patient areas but the tight budget dictated vinyl tile for the flooring. Saturating flooring colors in a creative pattern allowed a cost-effective choice to contribute to the overall success of the design. Despite program changes midway through the project, the opening date remained unmoved. In the end the Center’s opening was right on time. The infusion center offers patients a place that is both bright and soothing. The West Penn Allegheny Oncology Network has a space that assists in their patients’ fights of cancer. The finished space is also the result of a well-executed design. 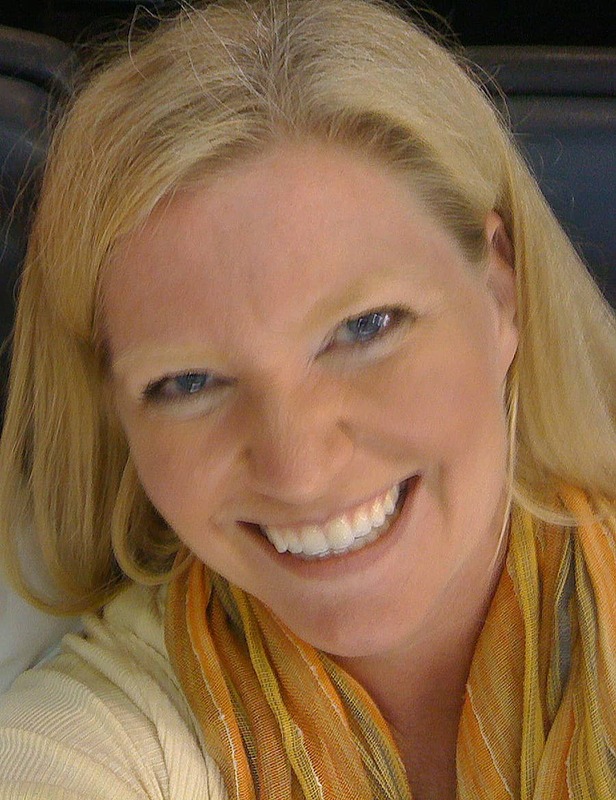 For more information on IKM, visit www.ikminc.com.